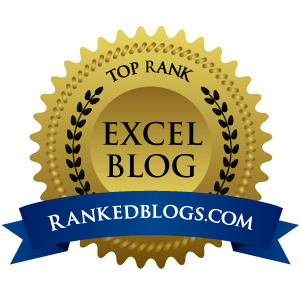 Excel's conditional formatting feature typically allows you to set the format of a cell based upon its contents, and allows you to define all sorts of rules upon which to do this. This is great, but what if you want the cell's format to be based upon the contents of a different cell (or cells)? 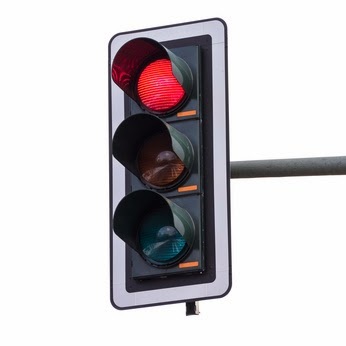 A typical use for this might be for a traffic light graphic giving a quick visual aid to understanding a set of numbers. Fortunately Excel provides a relatively straight-forward way of doing this. The answer is to use the formula option in Conditional Formatting. Highlight the cell, or range of cells, that the conditional formatting is to be applied to. 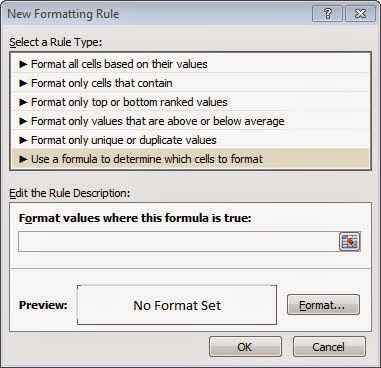 You can then type a formula into the box that will be used as the criteria to determine whether each cell is to be formatted, or not. The criteria should start with an "=" sign and then follow the same rules as the condition argument of an IF function. Where you are applying the conditional formatting to more than one cell, the criteria should be written from the perspective of the top left cell of the range being formatted. This becomes important in how it will treat relative cell references. Cell references can be made absolute using the dollar sign, as in a regular Excel function. Once you are happy with your criteria, click the Format button and set the formatting that you want to apply should the criteria be met. Let us take a simple one first. Say we wished to fill cell C3 with a red background, if cell A1 was negative. We then click the format button and select a red fill. As we are only formatting one cell, it doesn't matter whether we use dollar signs or not. Now, let's say we want the whole range C1:G10 to be coloured red if A1 is negative. We would select the range C1:G10, and then do the same as before, however now we need to consider how we want cells other than the top left cell of the range to be treated. If we didn't add the $ signs, then the criteria would be looking at a different cell each time. C1 would be looking at A1 (as C1 is the top left cell in the range), however C2 would be looking at A2, D1 would be looking at B1 and D2 would be looking at B2, etc. We may want the reference to be relative in other cases. Say we wanted to apply the conditional formatting to the same range, C1:G10, but this time wanted to fill the row (columns C to G) red when the contents of column A is negative. We are still fixing the column but not the row, so now C1 will look at A1 (as before), and D1, E1, F1 and G1 will also look at A1 as we have fixed the column to always be A. However C2 to G2 will all look at A2 as the row reference is still relative. Basically anything you could have entered as the criteria in an IF function (with an "=" sign in front of it). This will colour the cell red if A1 is less than or equal to -500, amber if it is greater than -500 but less than 500, and green if it is 500 or more. There, you can now do pretty much anything with Conditional Formatting! Great tip, this one Glenn - thanks! Glen - thanks it is very useful. Kindly give us more such tips. Thanks in advance & regards. Pleased you found it useful Ashit. If you have a large table and lose track of which line is which you can shade alternate rows using this. =MOD(ROW(),2) will return 1 on odd numbered routes and zero on even rows. Excel will interpret 1 as true so that row could be shaded by entering that function in conditional formatting dialogue box. I have a 12 month calendar on the left side of the spreadsheet (there are about 4 months across and then the next 4 are under that. Maybe Jan 1 would be A2, Jan 2 would be B2, etc. On the right side of the spreadsheet I have (for discussion sake) a single column to track certain event dates - let's call the column YY and the event name in ZZ. Let's say I'm tracking classes I'm teaching. YY2 is 2/3/15 and ZZ3 may read "How to Make Doohickies 101"
YY3 is 6/5/15 and ZZ is the next event. I'm trying to remember the conditional formula that would whichever date I TYPE into YY, it highlights the actual calendar date cell on the calendar I have on the left. So that if you are quickly wanting to eyeball the calendar, any colored date, I would see that the event is scheduled. Can you please help me with that formula? I really would appreciate it! As long as you have a corresponding cell with the date for that cell in it, or have the date in the cell on the calendar itself, then you can use COUNTIF in the conditional format. True Value = "Not Available"
what i need is that if H18 = any of these cells ($J13:$J$1048576) for it to come as "Not Available"
and if H18 doesnt = any of these cells ($J13:$J$1048576) for it to come as "Available"
The IF statement is just one condition, and you are trying to compare it to a range. You could use COUNTIF to count how many entries = H18 and then use IF to show "Available" if this is zero, otherwise "Not Available". That sounds like a number format issue. If you change the number format to General, that should solve your problem. Ok so I have managed to format the cells, so all cells showing a Y in Column D colour blue along with the cell value in column A, same with Column E if it shows K it will colour dark green and M will colour light green and will fill 'A' cell the same colour. Now I want to format it so if column D or E show Y and K or M the cell in Column A doesn't fill with a colour. Yes. You can use multiple conditions by using the AND and OR functions in the criteria formula. Glen, I'm trying to create an IF and THEN formula and it just won't accept it. I'm trying to say IF A1-B1 is greater than ZERO, THEN enter the result in C1. IF it is not greater than zero, then leave C1 blank. How do you tell there was a First Expired First Out (FEFO) breach. I have been doing this manually and will like to have a formula that is faster. There are a few ways but I think SUMPRODUCT might be the most efficient. Obviously, change the ranges to suit your data. I would advise against using the whole column as this could lead to a lot of unnecessary calculation time. Just pick a number of rows that will comfortably cover your data. This will return the number of rows that exist where the date in column B is less than that in cell B2 AND the date in column C is greater than the date in cell C2. If this number is greater than 0, then a FEFO breach has occurred. You could then use a straightforward IF statement (based on column D) to conditionally format the row as per my post. ($B$2:$B$1000< B2) returns an array of 1s and 0s depending on whether the condition is true (1) or false (0). ($C$2:$C$1000 >C2) does a similar thing with column C.
The SUMPRODUCT multiplies the two arrays together and sums the result. The resulting array will only include 1s where both conditions are true, as if either condition is false, we will be multiplying by zero. I'm using this statement =IF(A1>0,"true",""). The problem is that if A1 is blank(which isn't greater than 1), it is still putting "true" in B1. How can I make it show cell B1 as blank if A1 is blank? Your formula should return bkank if A1 is actually empty, however if A1 contains a space for example, it will return "true". VALUE(A1) will return the value of A1, or an error if A1 does not represent a number. Encasing the whole function within the IFERROR function will return the second argument of the IFERROR function if the first one returns an error. Will return "" if YourFunction returns an error, otherwise it will return the result of YourFunction. Which cells have you highlighted to apply the formula to? Hi, I have a big table of data, is it possible to use conditional formatting (if any row in collumn A=1 the shade that row? Great. It's just a specific application of this post, but a one that people want to do a lot. Is it possible to add conditional formatting to shade a range of cells grey if one cell (which already contains a Data validation list and is a merged cell) says "Non-beneficial" (non-beneficial is one of the options available in the drop down list)? Yes, just follow the steps above. That's great thank you! Can I possibly add a tiny bit to the formula that means if anything other than "Non-beneficial" is selected from the drop down box the cells will all stay clear? The easiest way to do that is just format them as clear normally. The conditional format will only kick in if the dropdown does equal "Non-beneficial"
It works! Thank you! You've been a big help! This is great thanks! One question though, if I wanted to conditionally format the cell based on the value after a decimal point, how would I do that? i.e. - if the value in the cell is 34.60 and I wanted to colour any cell red where the number after the decimal is within the range 50 to 70. Thanks. Ah you are a lifesaver!! Thank you! Regarding conditional formatting... If C3 is yes AND G3 is =>15 the format would turn the number(in G3) BOLD/red. Then IF C3 is no AND G3 =>30 turn the number (in G3) Bold/green. Just apply 2 different conditional format rules to cell G3. Choosing your required formats for each. Hi, I am trying to apply conditional formatting to a a cell that contains this IF(D6="Not Applicable", "Does Not Expire", IF(D6="","Pending", IF(D6>TODAY(), "Valid", IF(D6<=TODAY(),"Expired")))) and i would like to format as follows: Valid = Green, Expired = Red, Pending = Amber and Does Not Expire = Blue...How can i do it? You won't need a formula for that in the conditional formatting. Just apply four separate conditional formats to the cell, e.g. Do the same for each of the four formats. How do i do that when its a full column of items that have different result from the list of 4? It doesn't matter what's in the other cells. If a cell doesn't meet any of the four criteria, its format won't change. I am lost! I can only apply one conditional format per time. How can apply four at the same time? You don't add them at the same time. Just add one rule completely, then add a new rule in exactly the same way. I'm not clear on what you want. Are you saying that you want it to highlight red if it's less than 10, or that it is and you don't want it to. If you don't want it to, that would suggest that there is another rule being applied, so click Manage Rules, and remove the offending rule. I am having trouble coming up with a proper conditional formatting rule for a dataset. I am running a general ledger monthly report and I am looking to make it easier to identify values that change month to month by a certain dollar amount (250, 500, 1000, 2500). So in essence I want to highlight a cell red if the difference between its value and the previous cell is 2500 (either plus or minus). Then I want to do the same for the other three deltas. And to make matters worse I want to be able to copy that formula across many cells while referencing each cell's adjacent/previous cell. Please help and thank you. I am trying to get something done for tomorrow. and set your red format when you hit the format button. The ABS function ignores the sign, and it is important that you don't have the dollar signs on the references so that they will apply relatively over the whole range. Then just add anothe rile for each of the other deltas.